I was lepaking around Telawi earlier today...and there was something that caught my attention. 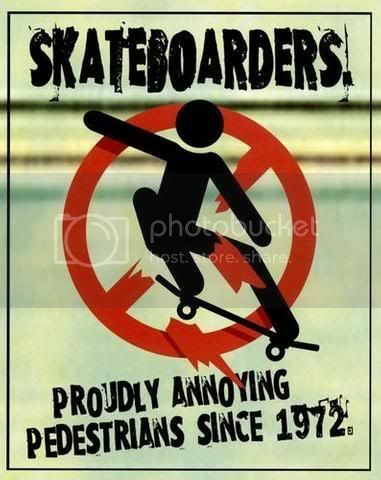 If they did kickflips around the pavements, it would be cool..but just riding on it? Not cool. Maybe you should walk, like everyone else. Infact; i saw a few sk8rs in Sunway who did a 180-impossible and 360-manual infront of the entrance of Sunway Piramid about a month ago. Now, that is cool. IF YOU HAVE A PROBLEM WITH WHAT I WROTE.. WRITE YOUR OWN POST IN YOUR BLOG AND LEAVE ME ALONE. FREEDOM! !